I saw something unexpected on my usual walk to Flushing Avenue by way of my favorite side street, Vandervoort Place last Saturday afternoon. 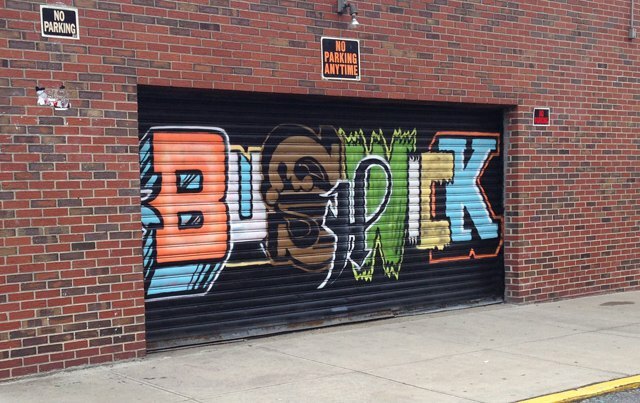 A new mural was in progress on the garage door around the corner from Bushwick Art & Shipping Inc., covering up the popular 'Bushwick' lettering by El Sol 25. This was one of the first murals to catch my attention in the neighborhood, being right around the corner from my home; something I could admire on my way to the the local spots, a recognizable icon to count on and capture as time and seasons passed...now gone. 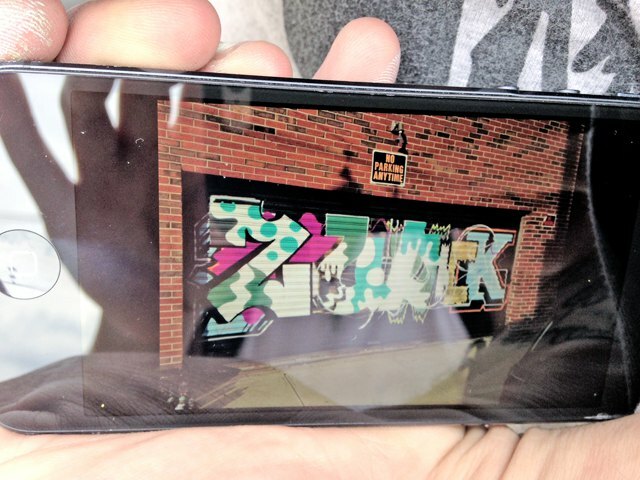 Zudon documented the covering of Esol25's 'Bushwick' mural as he painted on the nickname, 'Zude'. 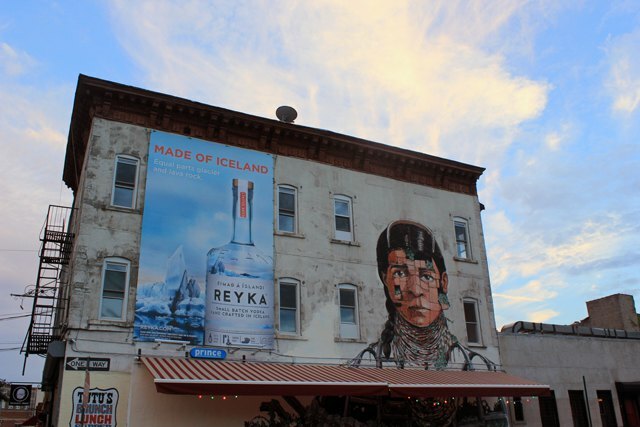 The artist documented the covering of Esol25's 'Bushwick' mural as he painted on the nickname, 'Zude'. Feeling disbelief, I kept walking—thinking, hoping—maybe I was only seeing things? I remember the recent switch up of murals by The Bushwick Collective during this year's Bushwick Open Studios, being relatively new to Bushwick as of last year, this was the first change I'd witnessed in the neighborhood street art, followed by the new Pixel Pancho piece up on the Tutu's wall on Varet Street. In the back of my mind I questioned: why such a drastic change, why cover the art? Everyone loved the Nychos whale! Pixelpancho's latest mural on the Tutu's Wall at Varet and Bogart Streets. I walked into Bushwick Art & Shipping Inc. where Diamond Crespa was working to ask… According to Diamond, "It was time for a change, time for something new. You can't keep something forever." This was when I realized that as attached as I might become to these works, and as many times that I will pass by them, they will one day be gone; painted directly over as the wall space enters into a freshly illustrated stage in the neighborhood. After all, the walls of our local galleries, coveted as the works and installations may be, evolve with the changing tides, keeping the momentum as well. Still a little surprised by this particular change up, I approached the artist in his process to learn the meaning behind the new mural. The lettering reads Zude short for "Zudon", which he tells me is a Japanese monster from the show Ultra Man (a TV show similar to Superman). Magenta, turquoise and aquamarine jumble with tentacle-like edges in Zude while further up the block Smithe's expansive maroon mural for Bushwick Art Park still persists (though it has been tagged upon recently—my thoughts on that are for another time). The eagle and the apple continue to tempt viewers with their drama, transporting Vandervoort Place wanderers from corner to corner. This takes us back to the now-closed gallery space Factory Fresh (2008-2012), which formerly occupied Bushwick Art & Shipping's corner at 1053 Flushing Avenue and transformed the area for these types of projects and public art. Of all the new public artworks appearing throughout the neighborhood, Zudon's newest piece in this local art center spoke to me the most, reminding me (and maybe all of us) that what we're used to seeing everyday may not be there the next.